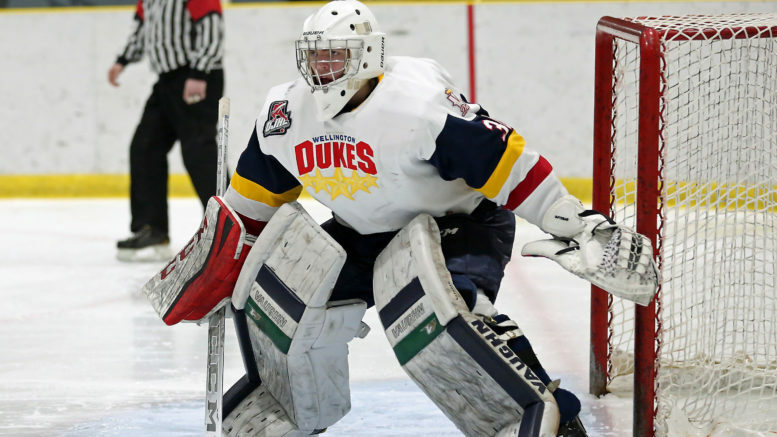 The Wellington Dukes had one singular goal this weekend and accomplished it. And while the club watched as the East Division caught up to them in number of games played, the locals turned the trick they were tasked with, blanking the host Lindsay Muskies 4-0 on the back of a 24 save performance by netminder Logan Bateman. The win moved Wellington’s record to 28-18-4 after 48 Ontario Junior Hockey League regular season contests. While Wellington will be hard pressed to catch the division leading Cobourg Cougars, the fourth place club still has designs of sliding into third or even second place in the East. Wellington trails Whitby by a pair of points and the second place Golden Hawks by a handful of points. Wellington’s Elijah Gonsalves had a goal and an assist in the Dukes’ 4-0 win in Lindsay on Friday. Certainly help will be required down the stretch but the Dukes still have four point games against both sides later this month. But until then, all Wellington can do is win the games that are in front of them and that’s precisely what they did at the Lindsay Recreation Complex on Friday. Eager not to replicate contests earlier this season where bad starts fouled any chance the Dukes had in beating Lindsay, Wellington effectively disarmed the Muskies thanks to a three goal first period. Wellington opened the scoring at the 5:25 mark of the first when Ben Roger’s feed found the stick of Elijah Gonsalves and the Pickering native roofed a puck past Lindsay starter Dean Buchholz. Just over a minute later and after a second Wellington tally was washed out, the Dukes doubled their lead when Dawson Ellis jammed home a rebound at 6:43 of the first to make it 2-0. In the frame’s late going, Andrew Rinaldi would feast on a Lindsay turnover and make it a 3-0 margin. Blake Curran took over for the Muskies to start the second stanza and mostly kept Wellington at bay save for a Zach Uens slap shot goal at the 10:54 mark. Buchholz and Curran were in the busier of the two twine tents as Wellington poured out 50 volleys on the Lindsay net. Bateman’s goose egg was his first shutout as a Wellington Duke. The Ottawa native has an 8-2-0 record since coming over from Nepean earlier this season to go along with a 2.85 Goals Against Average and Save Percentage of 0.913. 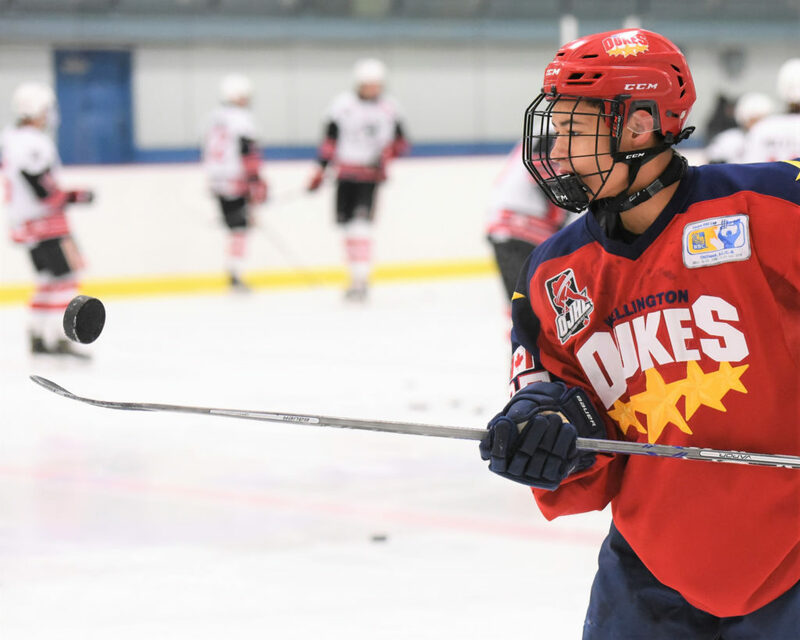 The Dukes will welcome the television cameras of Hamilton-based CHCH to Lehigh Arena on Saturday as Wellington and Kingston will play off in the OJHL game of the week. Puck drop is 3 p.m.
On Sunday, Wellington is tasked with another matinee as they travel to Trenton for a 1:30 p.m. Match against the host Golden Hawks. On Wed., Feb. 13, Wellington will be in Cobourg to face the Cougars and make up a contest that was postponed by inclement weather late last month.